Warning! If you have a swarm of bees that are threatening the safety of you, your family or your neighbors, don’t hesitate – call your Lakewood bee removal experts at Bee Busters! Lakewood is famous as a home for outdoor sports, recreation centers, parks and cultural events. This makes it the perfect travel destination for outdoor enthusiasts and families in search of culture and history. Places worth visiting includes the 4 acre Monte Verde Park, which offers a nature trail, a track through various ecosystems and overnight camping. Lakewood Country Club has 18 holes and 72 pars for you to spend a day golfing, along with other club amenities like a club house, practice bunker, pro shop, driving range and putting green. If you are a foodie, you should head to Lakewood for their Fireworks Extravaganza for Fourth of July weekend. This annual event block party is a half-day event where you can taste food prepared by local Lakewood restaurants and end the day with fireworks over the Lakewood Center Mall. Amidst all this outdoor fun, be careful of the possible meeting of a bee, wasp or yellow jacket infestation. As tempting as it apparently is, you should resist the urge to throw stones at wasp nests or spray them with the hose, as this is likely to make them go on a stinging spree. Even if you are confident in your ability to resist, keep in mind that children, for reasons that are beyond me, seem to find it irresistible to throw things at wasp nests. Therefore it is best to have them removed. 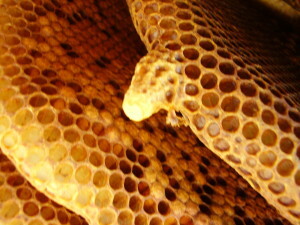 Fortunately honeybees, whose hives are rarely exposed, present less of a temptation to toss things. However once they’ve been established in an area for awhile the bees may become extremely sensitive, you so much look at a throwable object and they’ll preemptively sting you. For professional Lakewood bee removal services you should call Bee Busters, Inc. They have over thirty years of experience in local bee control, and can handle any bee related situation you could imagine. When you notice bees living on your property it is best to take care of it immediately — without immediate bee extermination, they’ll establish a colony which will require much more costly hive removal. 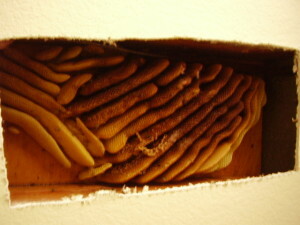 To fully remove an established colony, the structure containing it will need to be cut open. At this point if you’re on a budget Bee Busters can still perform an abatement without a removal, but removal is definitely recommended. Call us to discuss the bee control services we offer to find out what’s best for you and your situation. Bee Busters’ staff has tremendous amounts of experience in beekeeping, to the degree that more than one of them has been hired as a consultant to beekeeping operations around the world! They’ve worked on research, international development and commercial beekeeping operations in Asia, Australia, and Africa. When you talk to someone at Bee Busters about bees, you’re not just talking to “just another exterminator,” or even someone with a hobbyist level knowledge of bees, you are talking to a world class expert! If you are experiencing bee or wasp problems, you should hire Bee Busters, Inc. We are licensed, bonded and insured service provider of Lakewood bee removal service. 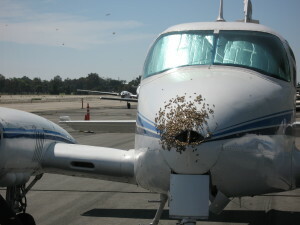 Call us at 949-497-6264 or 714-731-1959 and visit our for a professional beekeeper’s help and advice. Call your Lakewood Bee Removal Experts Today!